How to send email using simple SMTP commands via Gmail? 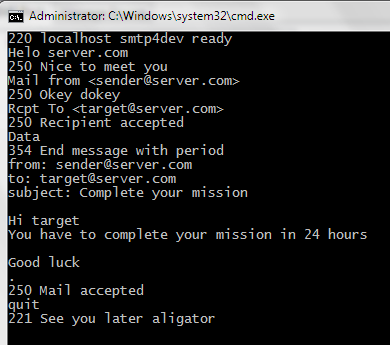 For educational purposes, I need to send an email through an SMTP server, using SMTP's fundamental and simple rules. I searched and found many links including Wikipedia's article about STARTTLS command. But I'm not able to use TLS and authenticate to Gmail's SMTP server using command line (or sending commands myself in programming languages). Can anyone help? Unfortunately as I am forced to use a windows server I have been unable to get openssl working in the way the above answer suggests. Install telnet client on the windows box. Download stunnel. (I downloaded and installed a file called stunnel-4.56-installer.exe). Once you have done this save the stunnel.conf file and reload the config (to do this use the stunnel GUI program, and click on configuration=>Reload). Now you should be ready to send email in the windows telnet client! This means that we are ready to authenticate by using our gmail address and password. However since this is an encrypted session, we're going to have to send the email and password encoded in base64. To encode your email and password, you can use a converter program or an online website to encode it (for example base64 or search on google for ’base64 online encoding’). I reccomend you do not touch the cmd/telnet session again until you have done this. And your email should now be in the recipient’s mailbox! : various aspects of your SMTP server, including TLS and AUTH. It has a lot of options and can do almost everything you want. === TLS peer DN="/C=US/ST=California/L=Mountain View/O=Google Inc/CN=smtp.gmail.com"
=== TLS peer DN="/C=US/ST=California/L=Sunnyvale/O=Yahoo Inc./OU=Information Technology/CN=smtp.mail.yahoo.com"
I have been using swaks to send email notifications from nagios via gmail for last 5 years without any problem. Based on the existing answers, here's a step-by-step guide to sending automated e-mails over SMTP, using a GMail account, from the command line, without disclosing the password. These instructions assume a Linux operating system, but should be reasonably easy to port to Windows (via Cygwin or native equivalents), or other operating system. # use with authentication against SMTP servers. echo -n "Email (shown): "
echo -n "Password (hidden): "
Copy the last line (AGJ...==), as this will be used for authentication. set address "[lindex $argv 0]"
set subject "[lindex $argv 1]"
set ts_date "[lindex $argv 2]"
set ts_time "[lindex $argv 3]"
send "Email sent on $ts_date at $ts_time.\n"
Paste over YOUR_AUTHENTICATION_CODE with the authentication code generated by the authentication script. Change YOUR_EMAIL_ADDRESS with the e-mail address used to generate the authentication code. ./notify.sh recipient@domain.com "Command Line" "March 14" "15:52"
Not the answer you're looking for? Browse other questions tagged email smtp gmail smtpclient smtp-auth or ask your own question. Why can I not do an SMTP telnet to gmail?